Café, cà phê, coffee. These three words can summarize the historical timeline of coffee in Vietnam and how the country has now become the second largest exporter of beans on the planet. 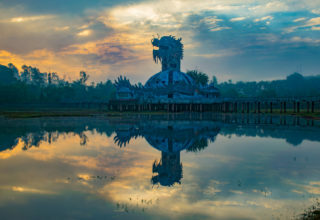 Let’s take a quick walk through the history of coffee in Vietnam. 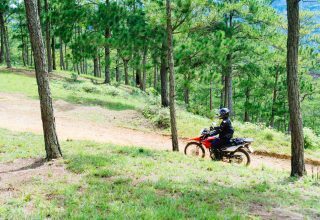 Then make our way into where you can find some of the best coffee and coffee producers in Vietnam. Will cover everything. From where Saigon’s first barista champion is now working to where you can get your hands dirty with one of Lonely Planet’s Global Coffee Tours featured business. Think you know coffee? 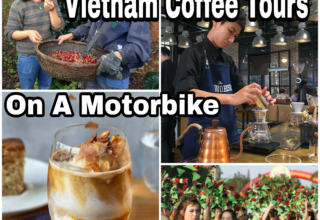 Wait until you see what Vietnam has going on with coffee. Vinacafe 3 in 1 coffee mix. Just when you thought coffee could not get any easier, one of Vietnam’s oldest coffee producers puts it all in one pack. 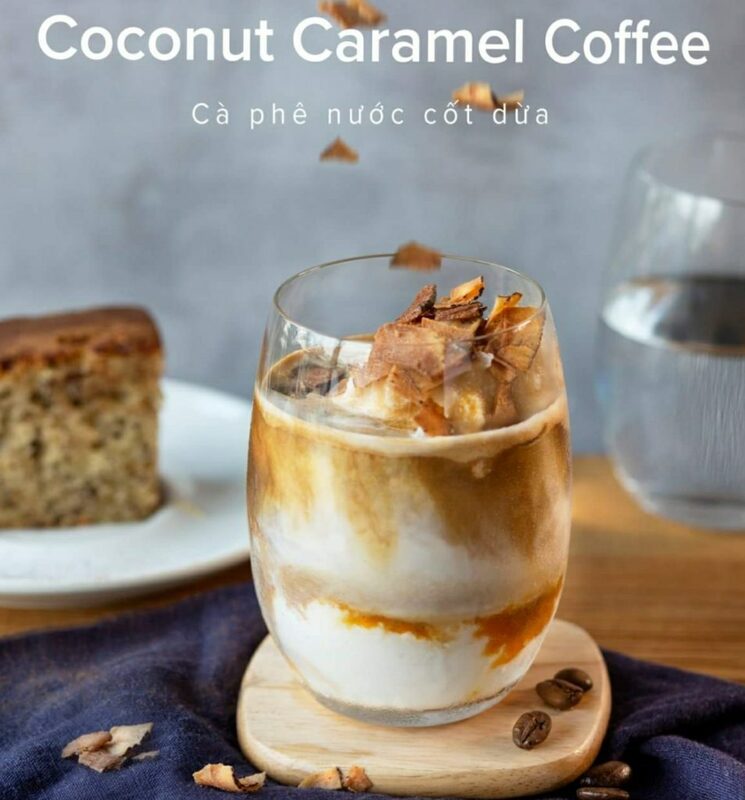 Café; The French, an ever-growing pain in the backside of Vietnam, had for a number of years in the 19th century been slowly staking their claims on Vietnamese soil. One of these crusaders was a French missionary priest, clearly not from the Mormon Church. Who, in 1857, had brought with him a coffee plant in the hopes of growing some beans. And with God’s will, planted them in a Church in Northern Vietnam. 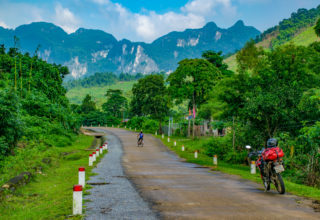 After some success with the Arabica plants, the crops slowly made their way into central Vietnam where the climate was better for production. Then, in 1887, the French decided that sending missionaries was not helping them stake claims fast enough. Instead, they began sending soldiers who set up and occupied what became French Indochina. Satisfied with their concurring success, but not with the café culture, the French then planted two other varieties in 1908, the Robusta and the Liberica. 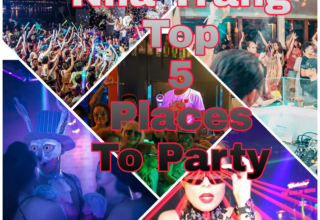 If you want to see what that French culture looked like in Vietnam, check out Da Lat City. 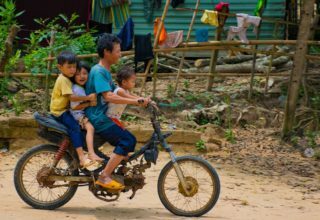 Cà phê; The Vietnamese, the hardworking bunch that they are, eventually grew tired of the French making themselves at home in their country. Vietnam fought back and by 1954 Vietnam had won their independence from France, following the First Indochina War and continued working on their coffee expansion. With a number of the French still living in Vietnam after this particular Vietnam war, one of them, engineer Marcel Coronel, established the Coronel coffee plant in 1969. He was looking to export cheap coffee to France. However, with the Americans moving in to start their own war, Marcel would vacate to France in 1975. After Marcel’s departure, history would appear to repeat itself, and the Viet Cong would take over the operation of the previously French occupied Coronel plant. Hard at work, the Viet Cong were producing instant Vinacafe coffee by 1977. Coffee; The western world, well known in headlines for its various addictions, has the largest demand for Vietnamese coffee. With Vietnam’s Robusta varieties being some of the best in the world, the EU imports 42% of Vietnam’s yearly coffee crops. With Germany topping the peak of single largest country importer with over 150,000-tonnes of the beans coming into their country in 2017. The United States is the second largest importer of Vietnamese coffee beans. For a country whose had America and Europe trying to throw their weight around and establish themselves in Vietnam. It seems that the Vietnamese have figured out a way to make them pay for their mess. A Frothy Vietnamese Egg Coffee. If You Thought The Vinacafe 3-in-1 Mix Was Complete, Wait ‘till You’ve Had Your Breakfast Eggs Mixed In With Your Breakfast Coffee. It’s one thing to buy coffee beans from Vietnam, it is quite another to pick yourself up an original Vietnamese coffee when you travel Vietnam. 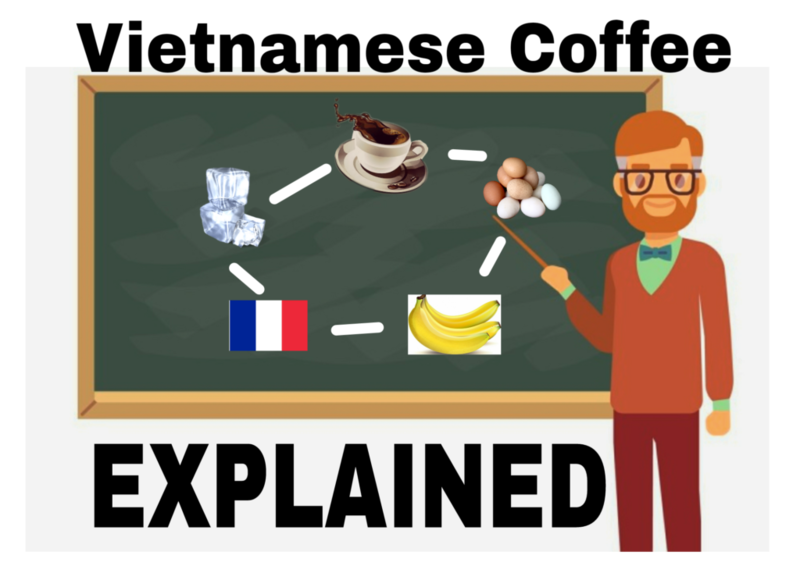 What is Vietnamese coffee? The Vietnamese seem to have some of the more unusual coffee tastes in the world. Sure, the Turks enjoy there cup unfiltered with hints of cardamom, and the Americans like there’s topped with whip cream and mocha drizzle. In Vietnam though, they like to push the boundaries with everything from banana to coconut and even egg yolks. 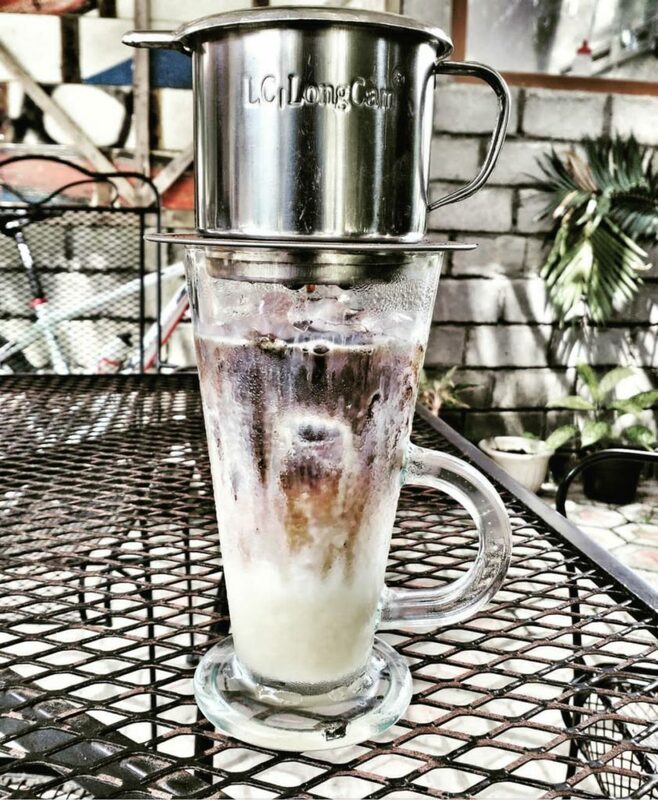 The Vietnamese Egg Coffee is not the sloppy coffee omelet you are picturing in your head. It’s more like delicate meringue frothed atop a robust brew by the hand of a talented artist. Or at least that’s the way it should come if you get a good one! 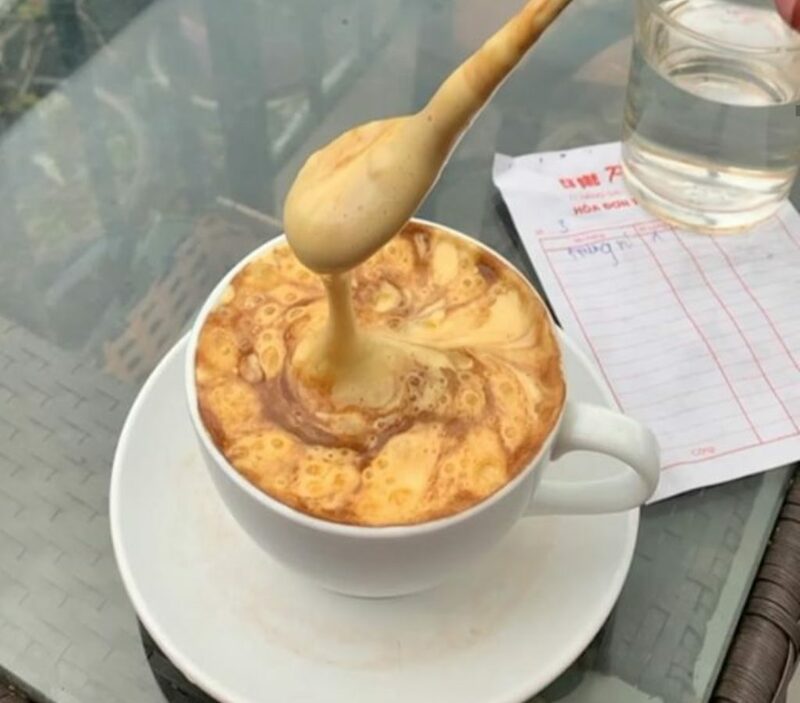 The Egg Coffee is more of a regional delicacy of the North and you aren’t as likely to find it in areas like the Mekong Delta and Southern parts of Vietnam. 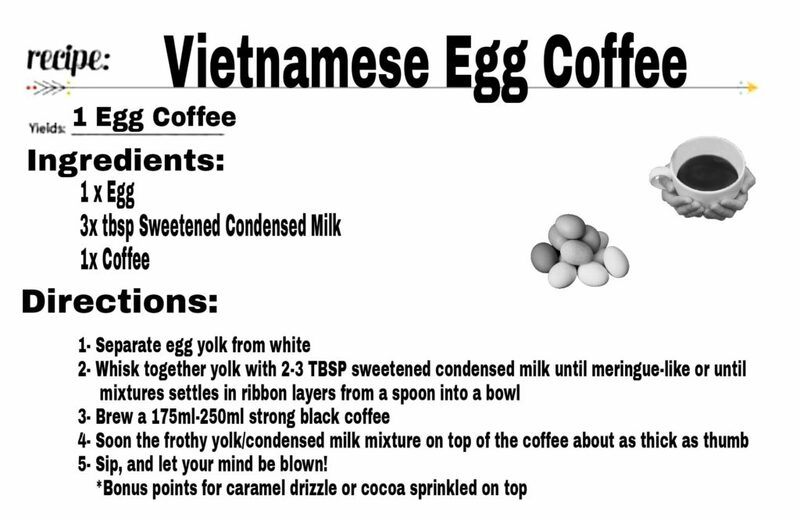 The idea for egg coffee was laid when Hanoi and other parts of Vietnam were hit with an udder milk shortage in the mid-1940s. A man named Giang was working at the Metropole Hotel in Hanoi and got cracking to solve the problem. Giang whisked egg yolk and sugar together to create a milk substitute, and the idea he’d hatched became a hit with hotel patrons, eventually spreading nationwide. You can try the original egg coffee at one of several Giang coffee shops while you are touring Hanoi and the North. 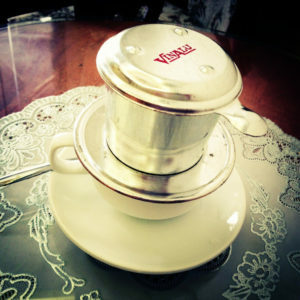 The Vietnamese Hot Coffee is more relatable to a jumped-up Americano with sugar. 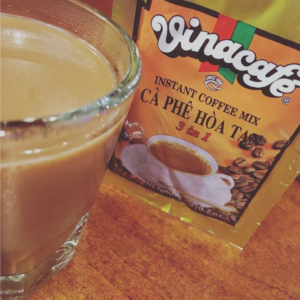 In this case the Vietnamese like to enjoy a very strong drip coffee, then offset the intensity of the coffee with sweetened condensed milk. The large ratio of coffee to a small amount of water, along with the slow brewing process will make the final product quite intense. Although some people often perceive a short and quickly brewed espresso to pack a stronger caffeine punch due to its concentration. It is, in fact, slower brewed coffees that draw out more caffeine and flavor than the more intensely brewed espresso style. 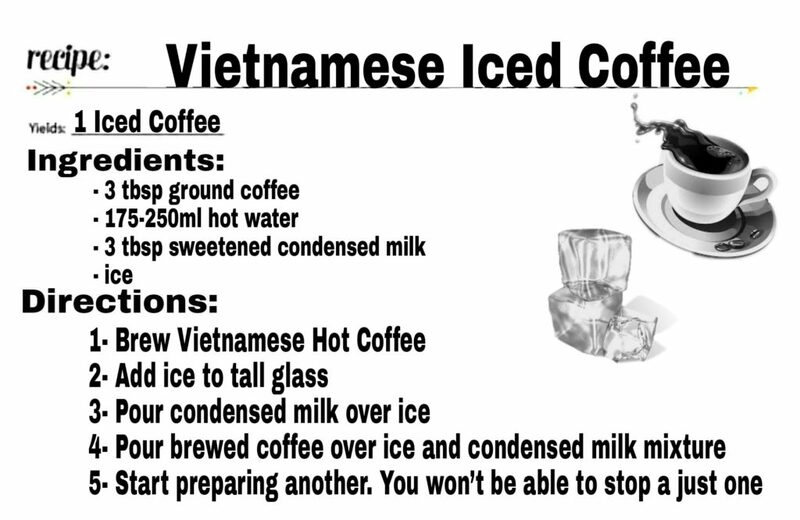 After enjoying a Vietnamese Hot Coffee you’ll be more laser-focused for navigating your way out of HCM than ever before..
A Vietnamese Iced Coffee Coming To Fruition. These Are Great To Brew Table-Side On A Hot Day. The Results Are A Caffeine Kick, Savoury Coffee Flavor, and The Sweet Condensed Milk. 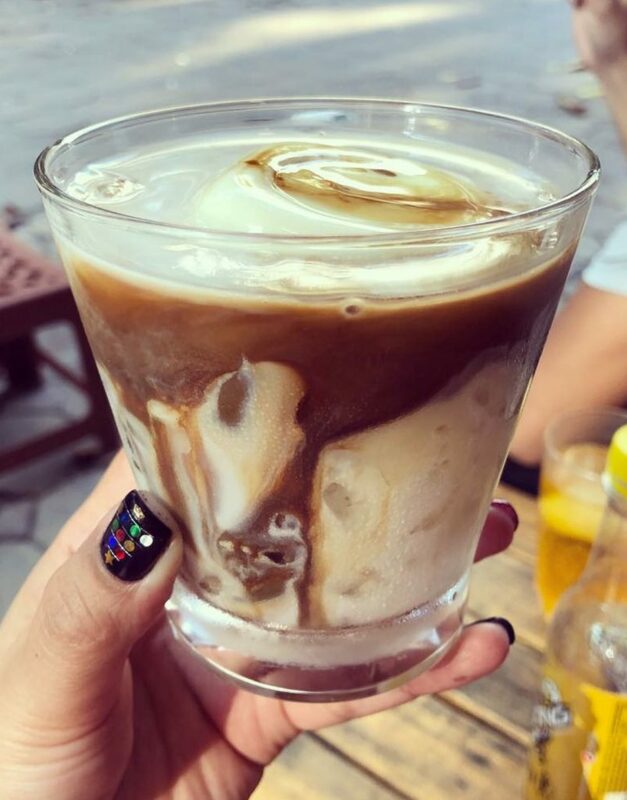 The Vietnamese Iced Coffee is like a gateway drug to those of you who are looking to get into the world of coffee but aren’t sure where to start. 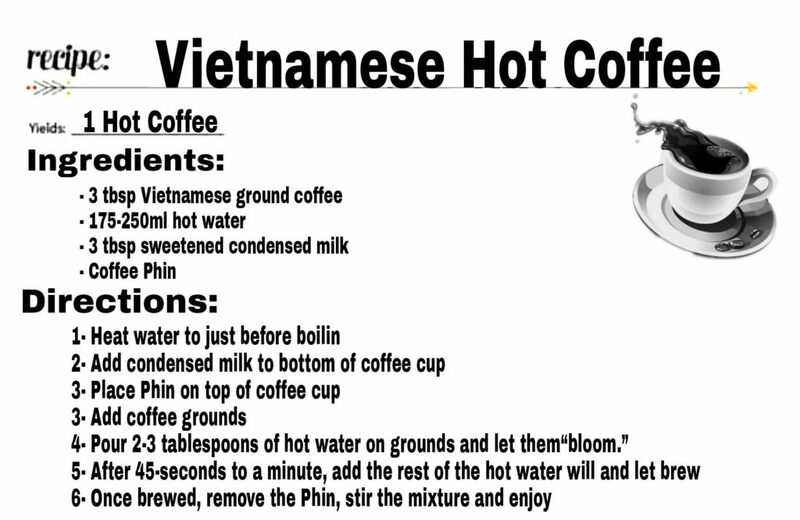 The process is basically the same as the Vietnamese Hot Coffee recipe. The same idea as your iced coffee but with plain yogurt mixed in and often topped with fruits like mango. A beverage likely to be scoffed at by coffee connoisseurs, it’s a fun way to try and make a meal out of a coffee. Pushing the boundaries of what the hell it is to drink a coffee. 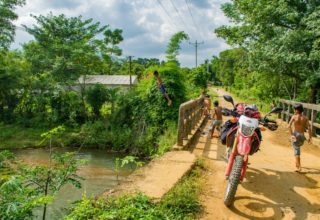 In the North of Vietnam by motorbike and the areas around Hanoi, you can likely find the magic of avocado and banana blended into a cup of joe. 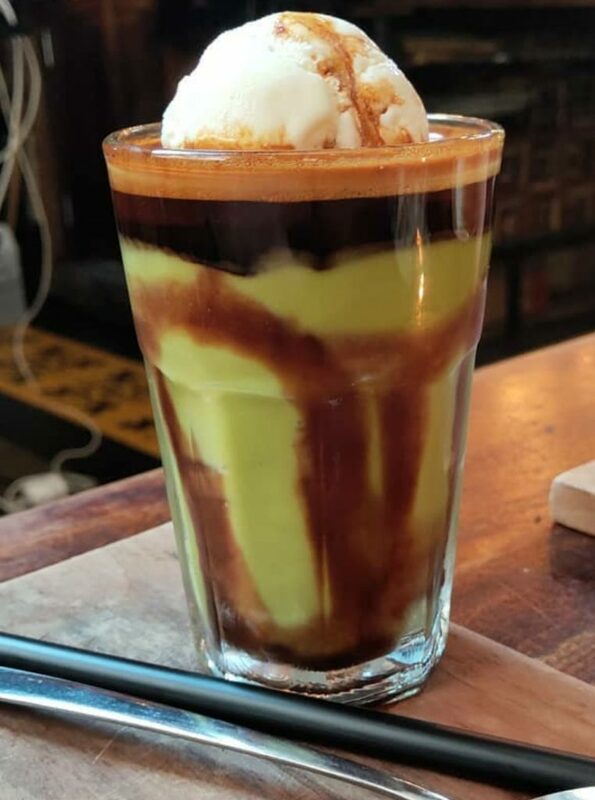 A little coffee, a little banana, a little avocado, maybe even some ice cream if you really want to get a lot in there. Wow, what a way to enjoy a coffee. A coconut coffee to the extreme. If you saw this in someone’s hand at a coffee shop, would you ask them what it is or just order your own? 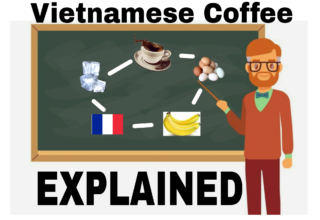 The French who brought the coffee culture with them to Vietnam found that getting their hands on a steady supply of fresh milk every day was difficult. Introduce shelf-stable condensed milk and voila, the sweet life goes on. Then they just needed to teach the locals to make baguettes & croissants, and all would be well in the world of colonization. Adding this incredible knowledge to the list of what to eat in Vietnam will soon make you a Vietnam foodie expert. Coffee in Vietnam has an almost otherworldly status and will likely make you scoff at simple drip coffee for the rest of your life. 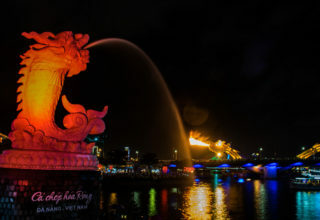 While you’re in Vietnam touring the highlights of the country and all its historical gems. Remember to get to know Vietnamese coffee from the roots to the roasting and all the styles they turn out once its brewed. 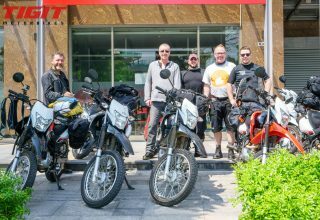 Now that you know your Vietnam coffee, you should get out and take a coffee tour by motorcycle in Vietnam. You’ll be happy you did.